D.N.B, MS - ENT, M.B.B.S. 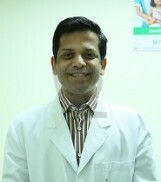 Dr. Anish K Gupta, MBBS, MS(ENT), DNB, is an Additional Consultant in the department of ENT at Fortis Hospital, Mohali. Prior to joining Fortis hospital as a full time consultant, he has been working in world famed institute PGIMER, Chandigarh, as a Registrar. Apart from this, he was also associated with Indus Hospital, Chandigarh as a Part time consultant. Dr. Anish completed his basic medical studies(MBBS) from the Government Medical College, Sec 32, Chandigarh and his post graduation in ENT from PGIMER, Chandigarh. During his practice at PGIMER, Chandigarh which is one of the best Medical Institute in India and Asia, he got expert training in all basic, advanced, endoscopic procedures of ENT and Head & Neck cancer surgeries. Airway balloon dilatation, a minimally invasive option for the management of airway stenosis, first time in the Northern Region. To his credits, he has bagged various regional and national awards in paper presentations, one of them is a best paper award at SAARC, an International Conference. He was honoured with an Excellence Award by Dr Manmohan Singh (Hon’ble Ex- Prime Minister of India) for meritorious performance in academics. Dr. Anish has 25 national and international research papers to his name in various peer reviewed journals and has contributed a chapter in 2 international books. He is a member of various professional associations and actively participates in various workshops & CMEs to update his skills/ knowledge with latest advancements in his field. He has also chaired sessions at national conferences and, was invited as a guest faculty for demonstrating the art of sinus surgery.